Join the discussion on our forums! 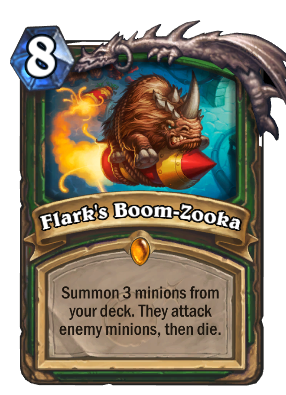 Come discuss Flark's Boom-Zooka over in our dedicated Flark's Boom-Zooka discussion topic. Even with Revenge of the Wild, this card is still bad. At 8 mana, you’re only going to play that combo on turn 10 (9 with coin, but that just hurts your first eight turns more), and there’s no guarantee you pull powerful minions or three beasts, unless you’re running a beast deck. So best case scenario, you pull King Krush and two Charged Devilsaur, who can likely kill three minions before resummoning to clear any other threats or go face. That dream scenario is obviously very powerful, but you’re more likely to pull weaker minions who can potentially kill opponent’s minions before you decide whether it’s worth it to resummon. That’s a very expensive turn for something that’s not guaranteed to help you with board control or pushing damage. In a hybrid spell hunter deck that includes a few powerful minions (and sacrifices the “no minions” benefit of certain spell hunter cards), you can boost your odds, but I’m not convinced that’s a better approach than simply running basic Spell Hunter. without nerf, we will see a lot of suicide beasts the following weeks. As of now, it's a dead spell meant to nerf Rhok'delar a bit. only if you have an other card you want to craft, only dust cards when u need other cards. This card is the most goblin thing that ever goblined. "They attack enemy minions..." This sounds like the targets are chosen randomly. Does this mean the three summoned minions automatically attack any randomly chosen enemy minions? Are enemy minion targets chosen randomly or does the player who plays this card get to select which enemy minions to attack and with which summoned minions? My only real issue with it is that the minions can all attack the same thing, even if it died already from the first attack. That really seems like an unnecessary and arbitrary layer of RNG not needed on this card. They should at the very least make sure to always attack minions that are actually alive first. They only attack minions that have health, they do not attack the same minion if it's already dead. I had a case where I summoned 2 Devilsaurs and a Krush while the opponent had 3 minions, none of them with more than 7 health, and two of my dudes crashed into the same minion, leaving one on board. It's a (more often than not complete) board clear for Hunter with potentially huge upside. Any sort of non-targeted AOE in Hunter is ALWAYS good. This thing is way underrated. Agree, I think the card has potential to be in a tier 2 deck. I have been having a lot of fun with it, the animation is simple amazing lol! Why doesn't this card have recruit? If they introduce a new keyword, why don't they keep using it? Because you don't Recruit those minions, you just mercilessly strap them to a rocket and send them towards their certain death.